Breakfast is the most important meal of the day, and I always aim to be well-prepared for it. When breakfasting in a new place, I always like to know what my food options are beforehand, but sometimes this is a little tricky. So today I’ll talk about the emergency breakfast I always pack when I’m on the go. 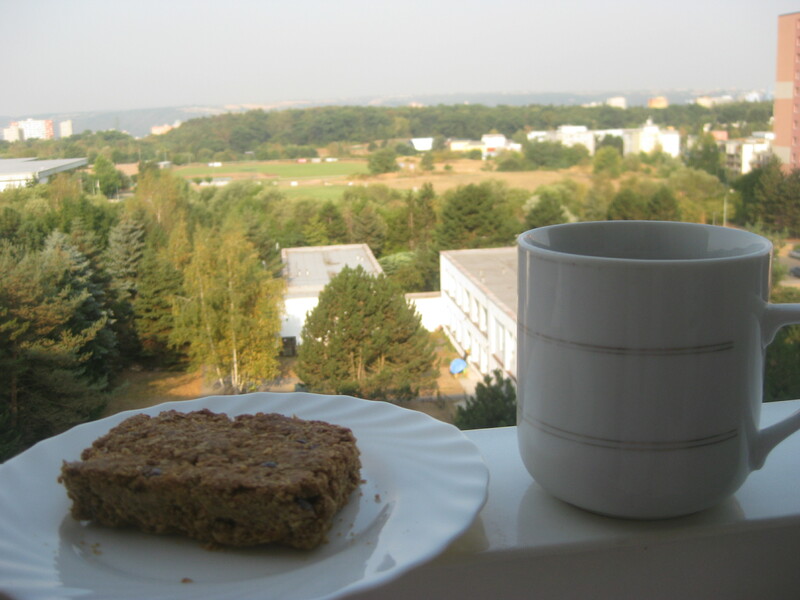 I’ve moved abroad several times now, and I always take supplies for the first breakfast, just in case I don’t have time to find a supermarket on arrival: a few teabags and the perfect breakfast snack, a flapjack. Before anyone can claim that flapjacks aren’t breakfast-worthy, let me point out that they contain oats, which are a breakfast staple, ergo they’re a legitimate choice (I may have had to defend this choice before). But they’re also a treat, which is exactly what you want on your first morning in a new place, when you’re feeling somewhat apprehensive. A few months ago I discovered this muesli flapjack from Unicorn in Chorlton, and it is ideal. It’s sweet and tasty, but it’s got “muesli” in the title, so it’s perfectly acceptable to eat it for breakfast. So this is what I brought with me for the move to Prague. The city was in the middle of a heatwave when we arrived just over a month ago, and the balcony of our Airbnb was the only place we could bear to sit for any length of time. It was hideously hot, but a wee bit cooler in the mornings, when we sat outside with our tea and flapjacks and wondered what the future held. Hopefully it holds more sweet, treat breakfasts like this! This entry was posted in Vegan Mofo and tagged breakfast flapjack, Unicorn Manchester, vegan breakfast, vegan mofo. Bookmark the permalink. I would definitely say that flapjacks are acceptable for breakfast 🙂 I shall have to look out for those museli ones next time I go to Unicorn. They’re very good! Eighth Day do great flapjacks too, but I think these muesli ones just edge it. Ha, that’s interesting – I remember in an episode of Mad Men someone referred once to making flapjacks for breakfast and I thought ‘Aha, so it’s not just me!’ and went and bought a flapjack after the episode because I couldn’t stop thinking about them. I’m a bit disappointed to know that it wasn’t a ‘real’ flapjack!